As I look back to January, 1964 when I was professed, I wonder where the years have gone. Fifty of these years were in Catholic education. These were divided into three parts, twelve years teaching classes kinder to Year Six, twenty eight years as principal of four different primary schools and ten years as a casual principal as well as being a member of staff in the roles of professional officer and pastoral care support. I have, as a Sister of Charity, been privileged in being part of eight primary schools, seven in NSW and one in Tasmania. I believe that education should be fun, that learning is about quality of life and obtaining the skills to bring about change. Children need to be given the confidence to go out into the world to change it, not be changed by it. I have witnessed many children grow in wisdom and grace as they embraced adult life and having served on the same staff as some of my former students, I have been humbled by their gratitude, love and adult friendship. As principal, I nurtured the potential in my staff members and have had the joy of seeing many of them also, in the leadership of some of our Catholic schools. At my last school, where I was a member of the pastoral care team at St John’s primary school, Auburn, NSW, I witnessed the principal and staff work tirelessly to ease the settling-in process for over 120 refugee students from many parts of Africa, but mostly, from Southern Sudan. I would enter the school gate, greeted by the sounds of welcome from these very friendly students. The bell would go, the children would assemble and parents would watch and listen to the morning prayer and announcements. Often the parents did not understand what was being said, but they would smile, knowing their children were safe. “Support” was the key word for my day: Supporting teachers and for the most part supporting children in their school work, giving them time out when things got too much for them, helping with their medication, monitoring the diabetic, preparing work/resources and conducting programs. Working in pastoral care would often lead me beyond the school and that varied from day to day. In all, my day was “hearing the cry of the poor” and being free to do something about it! On leaving education, my hope was to give back to the Congregation in gratitude for all the care and professional support I have been given during fifty years. Apart from being pastorally available to our sisters, my recent ministry has been in communication and Congregational history. My work in Congregational history has been focussed on work, my aunt Sr Genevieve Campbell, our first Congregational archivist, was asked to do in 1987. I have now updated this history according to the information in the archives, with the support of our Congregational historian, Sr Moira O’ Sullivan. We now have a digital form of this work which previously was not possible. My initial aim was to make available to the Sisters this marvelous insight into the life of our Congregation from its beginning in 1815; the generosity of our Foundress Mother Mary Aikenhead in 1834; the arrival of our First Five Sisters in Sydney, New South Wales in 1838; the departure from Sydney and arrival in Hobart, Tasmania in 1847; and the coming together as one Congregation, Sydney and Hobart in 1890. Digitally that is now possible. The next part of the dream is an audio version of this history. Among many inspirational times in my life, two stand out. 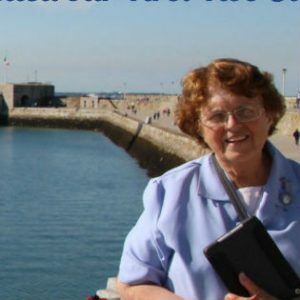 In 1990, my sojourn in Jerusalem, walking in the footsteps of Jesus, and in 2015, my three weeks in Ireland (photo shows Dun Laoghaire, from where the original Sisters of Charity departed for Australia), walking in the footsteps of Mother Mary Aikenhead. Supporting Pilgrimages in the Footsteps of our early Sisters in Sydney and Hobart has also been significant. My ministry as a Sister of Charity, I now see as I look back, as being able “to give to the poor what the rich buy for money,” “hearing the cry of the poor” and being able to do something about it. As Mary Aikenhead was given the example by her parents, I too owe so much to my parents, my family.